The campaign editor is a powerful tool which allows players to create custom campaign maps. Chucklefish developed this editor early in development, with the intention of using it to construct the game's campaigns and make available to players. It's a powerful developer tool which is included with the game on every platform. The editor was developed as a tool simultaneously very powerful and easy to use, regardless of whether you’re using a mouse or gamepad. Scenario markers can be dropped on the world map, representing the different missions that players will encounter. They are then connected with paths (denoted by dotted lines), which represent the routes available to take between missions. Branching campaigns are fully supported, and players can specify the conditions necessary for certain paths to become available. For example, a player might need to S-Rank a mission to reveal a secret encounter, or choices inside the mission might lead to different locations on the map. A campaign is a series of connected maps. To start a map place a map icon on the world map inside the campaign editor. Then select the properties tool and edit that map. 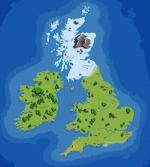 The map editor and its tools are explained in much further detail in this article. Map Icons Selection of the map icon appearance, and allows placement on the map. Paths Allows path connection between map icons which players use to travel from map to map. Inspector Display properties for selected map, and edit properties like name, misson type (main or side), and other map details. Also allows changing of the maps icon. Move Maps Allows movement of map icons to different positions on the world map. Settings The settings button (shortcut ESC) brings up the 'Campaign Editor' menu, 'Campaign Properties', Play through, reset progress, and allows Saving and Exiting the editor. When properties is selected in the toolbar, each map icon will open a properties window when selected. The edit button at the bottom of this window will open the Map Editor. Other properties can be adjusted here. Map Name The name of the map. Use the map editor to edit this name. Stage "Start" is where you start the campaign. An "end" terminates the campaign upon completion. Type Indicates if it's a main mission or a side-quest. Month The month the mission takes place in. Day The day the mission takes place in. Region The area of the world the map takes place in. Mission The number or designation for the map. There are two triggers available to attach to each map. These can each be set to toggle flag state and determine the characters which travel in the overworld map. Flags can be created and managed in the Settings menu under Campaign Properties. This is also where the initial party of characters which begin the campaign on the overworld map can be selected. Campaign: Flag Triggers if a certain campaign flag is either set or unset. Campaign: Party Member Triggers if a certain character is either present or absent from the party. Name The name of the campaign. 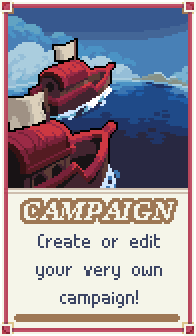 This will be displayed on the campaign browser. Description A short description of the campaign. Music Choose which music to play on the world map of this campaign. World Map Choose which world map to use for this campaign. Auto-Start If this is ticked, the campaign will automatically start from the first mission. Six World Maps, each featuring a different continent, are available to choose from in the Campaign Editor. The world map dropdown has them all listed by name. Albia A grassy island with a desert in the northeast and tundra in the south. Arthuria A replica of the British Isles. Aurania A temperate, crescent-shaped island continent surrounding a volcanic isle. The setting of the main story campaign of Wargroove. Hibernum An icy land consisting of two peninsulas separated by a strait. Solitudus A peninsula dominated by a vast desert. Wyrale A forested peninsula bracketed by warm lands to the east and cold lands to the west. The characters which start the campaign on the overworld map. The Map Properties menu enables missions to add or remove characters as they pass through them. Flags are toggle-able switches with a true and false state. They can be set through maps on the campaign through the map properties menu. This page was last modified on 13 February 2019, at 14:46.